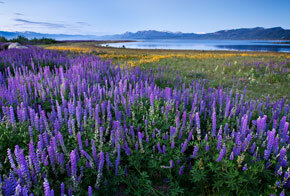 It may be hard to believe, but Spring is rapidly approaching, and the setting of Tahoe is an excellent destination to observe all of the beautiful seasonal transformations. From extreme outdoor activities to more relaxed options, there are plenty of things to do in Lake Tahoe to help rid you of any lingering winter blues. Every year, Lake Tahoe celebrates the a cold and fun start to spring with SnowFest! The event consists of nearly 100 events over the course of 10 days which include parades, light shows, fireworks, pancake breakfasts, concerts, nightlife events, races, eating contests and more! This annual event is all about fun, but also provides a great opportunity for some of the non-profit organizations in the area to fundraise and promote their causes through exciting and educational events in the community. 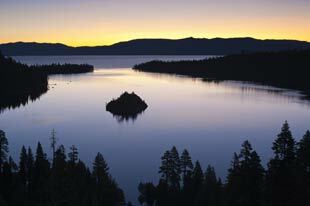 Will You Be at the PEEK 3-Day Grand Opening Weekend at Harrahs Lake Tahoe? Lake Tahoe is welcoming a new nightclub to the scene, and welcoming Paris Hilton go come host the grand opening. If that wasn't big enough news already, the PEEK Nightclub Grand Opening has recently been expanded into a 3-day event this President's Day Weekend. Winter is in full effect this February, and all of the ski resorts in Lake Tahoe are keeping people coming back from more every weekend. But people aren't just coming back for the snowy slopes right now, there are tons of things to do in Lake Tahoe other than skiing. 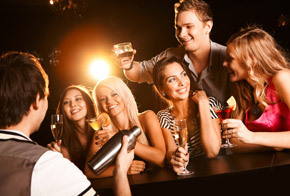 Concerts and events are attracting people every weekend, and this weekend is no different! 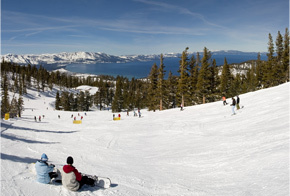 Listing the “Top 5” ski resorts in Lake Tahoe is pretty subjective (they’re all awesome) but we figured for this post we’d list the top 5 based on reported snowfall or snow depth as of today, January 29, 2013 at 4:00pm PST. And why not as snow depth in Tahoe can be epic and with over 15 well concentrated ski resorts, is unlike any other ski region in the country. From Sugar Bowl on the north side of the North Shore to Kirkwood located south of South Shore, Tahoe boasts over of over 400” of annual snowfall and more than 300 days of sunshine. The weekend is approaching fast, and it's going to be a beautiful one at that. This weekend in Lake Tahoe, skiers and snowboarders are in for blue skies and no chance of snow until late next week. 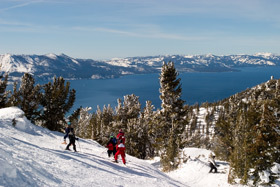 This is going to be a great weekend for a ski trip to Lake Tahoe! The weekend forecast includes temperatures in the mid- to upper-40s. 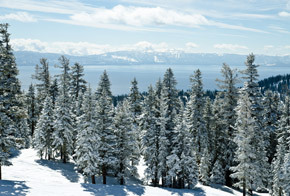 Tahoe Ski Resorts Opening Early in 2012! Lake Tahoe has gotten an unexpected amount of snow so far in 2012. 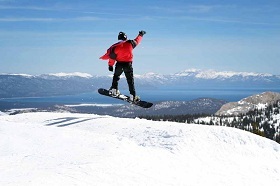 Usually, the ski resorts in Lake Tahoe don't start their season until sometime in December, but the 2012/2013 season is going to be one for the books! There are a few ski resorts who have decided to open early to take advantage of all the snow that has already fallen in Lake Tahoe. Tahoe has gotten more than 18 inches recently, and the consistent low temperatures will keep the snow on the ground for a while. 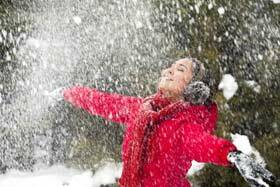 Tahoe's First Snow Fall - Things to do in the Snow in Tahoe! This morning marks the first snowfall of the season in Lake Tahoe! This has been long awaited for many of us, and we're thrilled to see it's still coming down! We'd say this marks the time that you can start planning your winter trip to Lake Tahoe, in case you haven't already started! Why go all the way to Alaska when the thrill of the outdoors and dog sledding can be enjoyed right in Lake Tahoe? 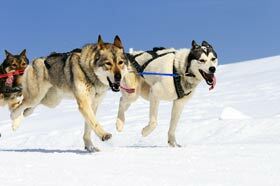 Dog sledding in Tahoe is a great chance to try something different and to get out on the mountains if you're exhausted from skiing (or if you've given up trying to learn!). Let someone else do all the work for once! And by someone, we mean a team of huskies. When you're at the "Best Lake in America," there are a few things you're going to want to do. 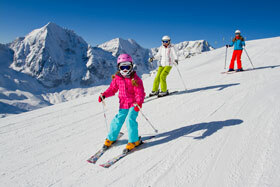 You want to pack in tons of water sports and scenic hiking or mountain biking in the summer. You want to ski all winter. You want to catch a beautiful sunset any time of the year.